SINGAPORE, (AFP) - When Prime Minister Lee Hsien Loong was sworn into office a year ago, he urged politically timid Singaporeans to shed their inhibitions and speak up on important issues. As Singapore prepares for its 40th National Day celebrations on Tuesday, the son of independence leader Lee Kuan Yew will find that young Singaporeans are taking him up on his offer -- but not necessarily in the manner he expected. Last Friday, in an arts center just off the smart Orchard Road shopping belt, dissident artists and punk rock musicians staged their own pre-National Day indoor concert to demand an end to executions in Singapore. After police barred them from displaying the image of a man hanged in May on drug trafficking charges, some concert participants wore black T-shirts saying "Abolish Death Penalty" and "F__k Your Politics". Earlier, gay and lesbian professionals, angered by a police ban on a yearly beach party coinciding with the official celebrations, launched IndigNation, a month-long series of forums to assert their place in society. Independent websites and blogs have also mushroomed, questioning everything from Singaporeans' prudish sexual conventions to the government's decision to lift a ban on casinos. And, in a high-tech version of people power, an Internet-based petition helped force officers of the National Kidney Foundation, a charity identified with the political establishment, to step down in July after its chief executive admitted earning over 350,000 US dollars a year. For younger Singaporeans who did not experience the racial strife and poverty of the republic's early years before it became Southeast Asia's richest society, prosperity is no longer enough -- a point Lee himself acknowledged. 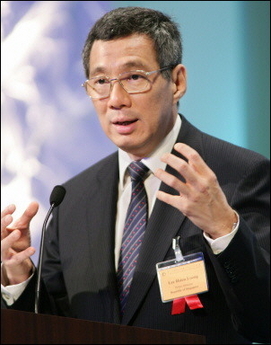 "We've been successful, wildly successful," Lee said in his first policy speech after taking over as prime minister in August last year, "but we can't stand still because the world is changing, our people are changing and so must Singapore and so must the way we govern Singapore." "I can connect with the young people," said Lee, 53, a former brigadier general educated in Britain and the United States. He vowed to "empower" young Singaporeans and encouraged them to "engage your ideals, your ideas, your energies, build a new generation, build tomorrow's Singapore" by getting involved in politics and other activities. The contours of what has been termed "civil society" -- a non-partisan political space of free speech and alternative ideas -- appear to be taking shape in Singapore, powered by the Internet and driven by young, educated and dissatisfied citizens. "I do not belong to any political party. What we want is a more compassionate society," said lawyer M. Ravi, 36, who had defended Shanmugam Murugesu, 38, a former soldier and champion athlete hanged on May 13 for trafficking about one kilo (2.2 pounds) of marijuana. Ravi was speaking on the sidelines of last Friday's "Hung at Dawn" indoor concert at the Substation arts center, which began with an MC declaring the event was held to remember Murugesu and other people "who are victimized by this capitalist system." Human rights watchdog Amnesty International said last year that more than 400 people had been executed in Singapore between 1991 and 2003, which it described as a "shocking number" for a nation of just over four million people. Ravi and other young Singaporeans are finding their voice outside the pro-government media and the traditional political party system dominated by the ruling People's Action Party (PAP) since independence. "The opposition parties need to also address or contend with civil society and not just be preoccupied with votes because the structures need to be taken down before you see change," Ravi said. But despite their defiance, young dissidents remain wary of the apparent new openness in Singapore. "There's always that fear of incarceration," said Seelan Palay, a 21-year-old guitarist who belongs to the band Ila Mitra, named after a late Bangladeshi peasant activist. Speaking during a break in the concert, he said he was part of a "collective" of fringe artists and musicians who "choose not to conform to mainstream media and all its corporate control." "The day that we can do things like this without the fear of being implicated is the day that Singapore truly becomes a more open and free society," he said. While the government appears to be tolerating a greater degree of political expression and some groups keep testing the limits, the fundamentals remain firmly in place. In an official National Day gathering last Friday, Home Affairs Minister Wong Kan Seng, who oversees internal security, warned that the government will never compromise on "the rule of law" and civil disobedience is not an option. "When anyone advocates the wilful breaking of the law, regardless of whether you think it is a silly law or not, he does violence to the rule of law even if his actions are peaceful," he said. "No one is above the rule of law," he added.